Netflix recently released a series about the food supply chain, and the first episode is about honey. 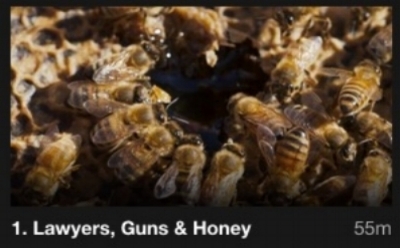 The episode is well-done, but it's not really about bees as the thumbnail above would suggest. Honey is the star of the show. There's little discussion about bee biology, and no mention of varroa, viruses, or barely any other diseases or pests. While it's not a source of information for people wanting to learn about honey bees, that's not all bad. There are other documentaries that cover that subject, and the story of honey is often overshadowed by the plight of the bees themselves. The bottom line message is that China is adulterating honey and illegally shipping it to the US, where it's sold at our grocery stores under false labels. This adulteration--usually dilution with cheap syrups that are difficult to detect without sophisticated testing--is a serious concern for people who want to know what they're eating, and also undermines the economic viability of honest honey producers. The flood of fake honey from China has artificially depressed prices, to the point that most profit to be had in beekeeping is from either being crooked or by migrating to the almond bloom each year with semi-trucks full of hives. In the end, if you're buying honey from a supermarket, you're almost certainly eating fake honey at least some of the time. The only way to be relatively sure your honey is real is to find a local beekeeper, get to know him or her, and become a customer. You'll pay more per pound than you pay at Walmart, but you'll still probably be paying below cost to that beekeeper. Plus, it'll actually be honey.